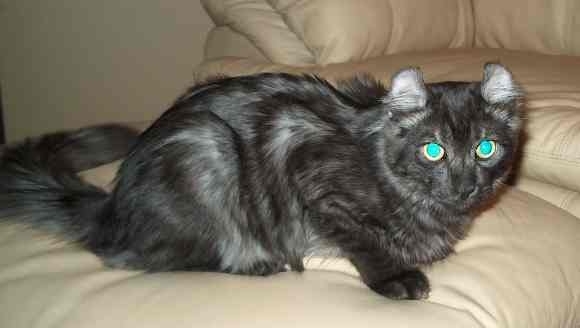 We've stated that we believe we provide the best American Curl cats you will find anywhere from the comments we receive from the owners of our babies. We decided that rather than asking our visitors to take our word for it, we would let you read some of the comments we have received. . 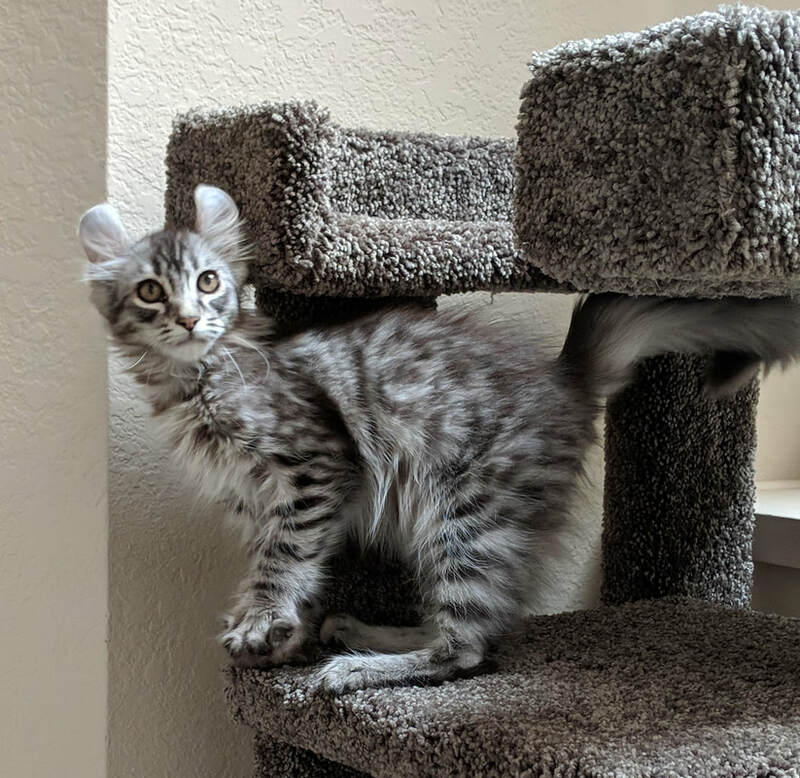 This is not only a testimonial page, but a way for you to see how our babies on our Kittens for Sale page have changed the lives of their new owners... oh ya, and how you can expect them to change your lives too. 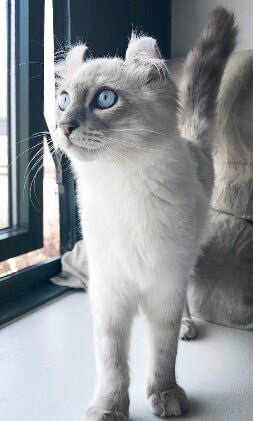 Nemo is seal point boy. He has been with his new owners for a couple of months when I received this email from his new owner. He is 6 months old in this photo, so 7lbs is about right for his age. He will continue to grow a little more but not as noticeable as these last couple of months. By 8 months of age, our kittens are pretty much full grown. Most of our boys are around 8-1/2 - 9lb. Hi, Linda. I am so happy that I have Nemo. Nemo is a sweet adorable boy . Very very active, a little bit notice, but he is just sooo cute to be blamed. And here is the picture I took yesterday. He grows very fast and he is already 7 pounds but I remember that you told me he gonna be under or around 8 pounds when he is full grown. 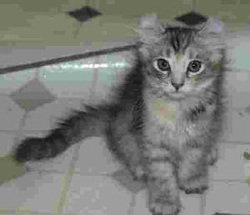 Neptune is a silver mack tabby that met his new family recently (including the family dog.). It looks one big happy family. 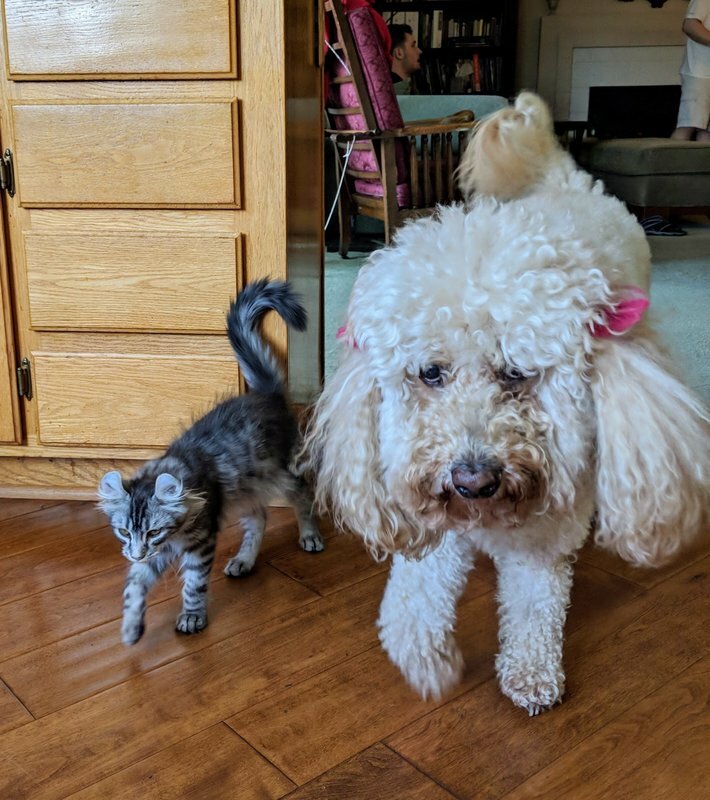 Our kittens frequently go to homes with other pets. Usually, it can take a day or maybe even two for them to figure out that the other one isn't a threat, but that's about it. I love the photos from new owners with their other pets. 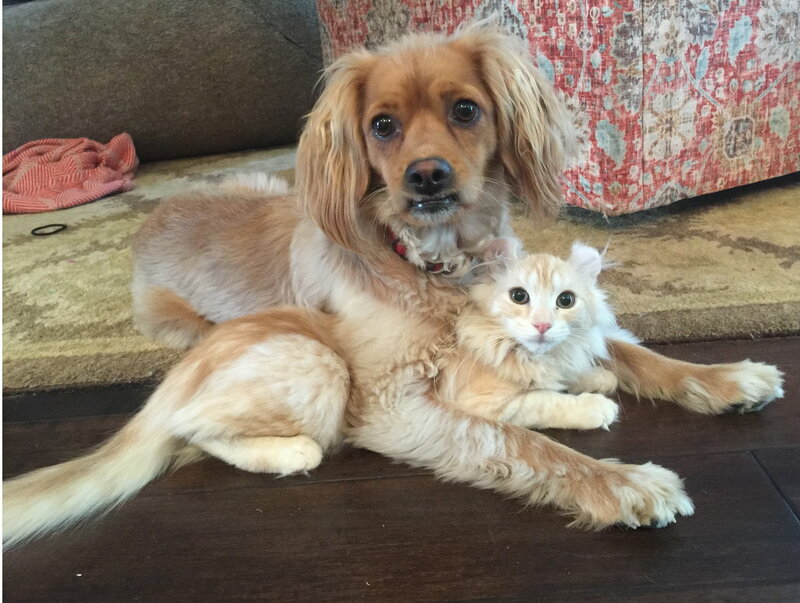 These two look like they're buds. ...Thank you, MaryAnn, for the email update and the photos. We love this little kitten. He is a joy to us! Here are some photos for you. I loved these photos taken right after he arrived in his new home... especially the one of him snoozing in mom's slipper. ​Hi Linda, How is everything going? When we picked up Yuuto and arrived home yesterday was already midnight. Yuuto is so beautiful and adorable! We were really surprised by how fast he adapted the new environment. He was not shy at all, instead very friendly, clingy and energetic. He purrs non stop like a motorcycle, and craves for attention. My boyfriend and I loved him so much already. 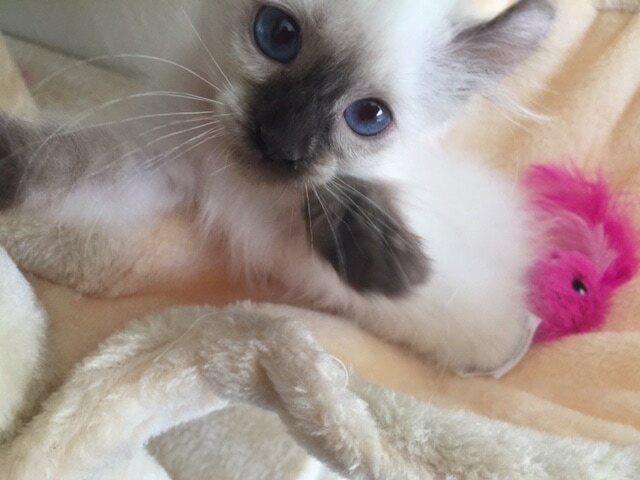 Thank you so much for let us having this little sweetheart in our family! ​We took some cute pictures for him. 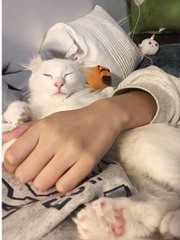 He looks like he is happy, and comfortable in his new home. Thank you again for everything! From these pictures, it doesn't look like he even misses us. 1st text we received from mom: "thank you so much again thank you thank you!!!! For doing this for getting him there early and making it all possible. We love him so much. He is a purr machine. 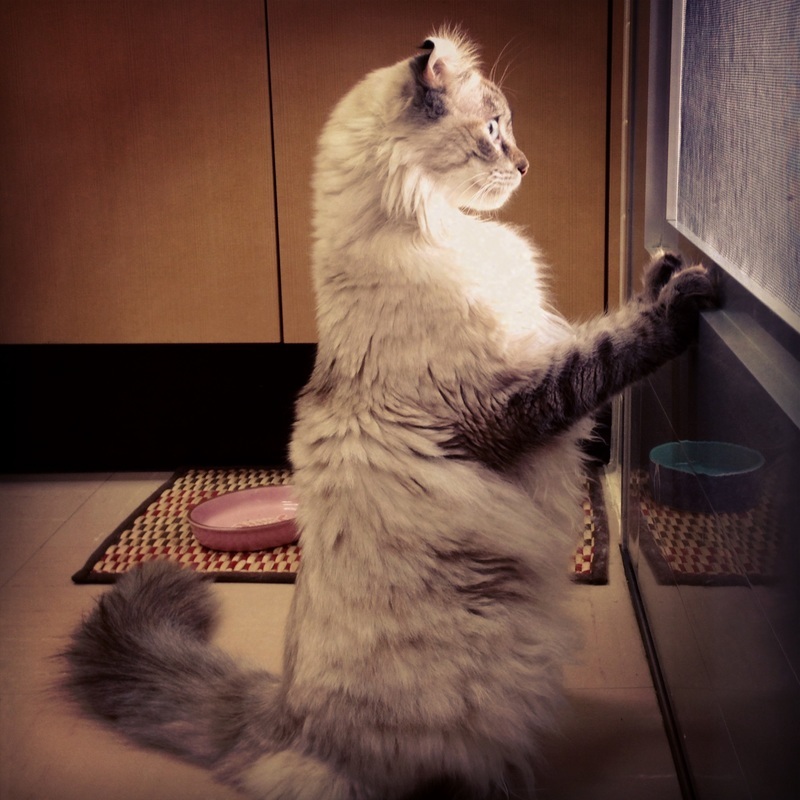 What a perfect cat." Needless to say, we got lots, and LOTS of Christmas morning photos. I created the slide show below with just a few. Mom's emails from the day before Christmas are on the right. 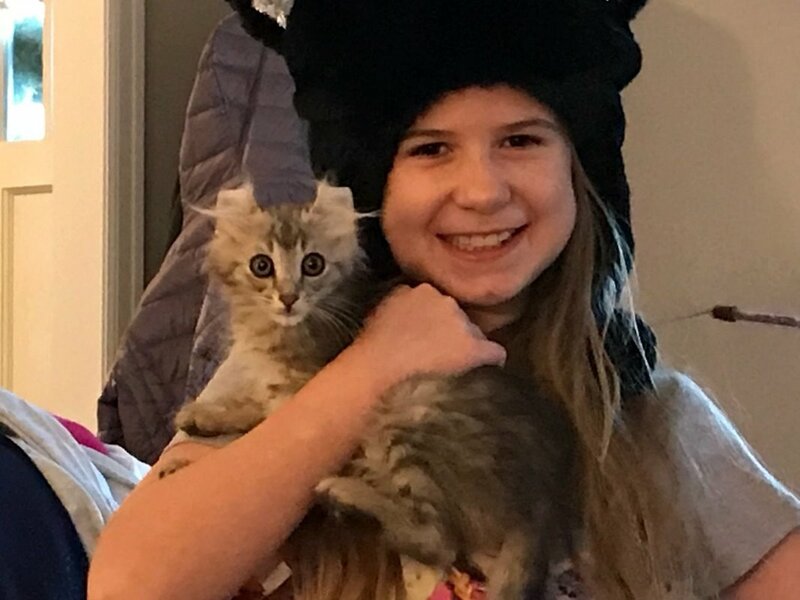 We do what we do just for the joy we know our kittens bring to the lives of their new owners. 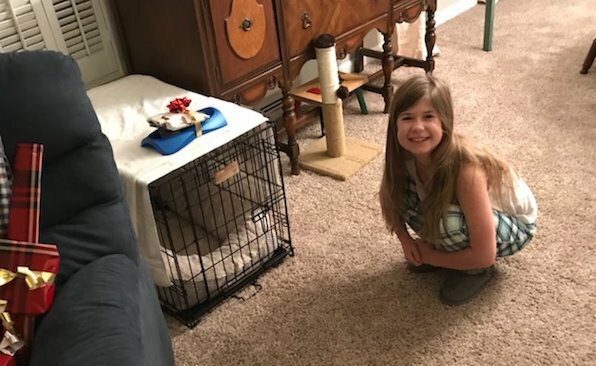 Here's what Vanessa had to say about her new kitty. I'm sure we will hear more in the days ahead. 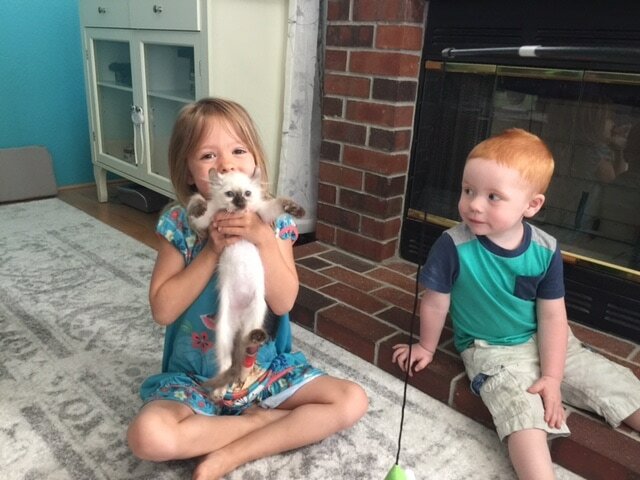 These kids are too cute holding their new kitty. This was so cute when I read it, I had to post the email. I can just visualize everything Haley says below. It's so typical of our kitties. I thought I'd give you guys an update on how she's doing since its been close to a year since I got her. Marceline owns the house now, she tells me when it's time for food or treats, or time to play. She's so spoiled, but I love her so much. 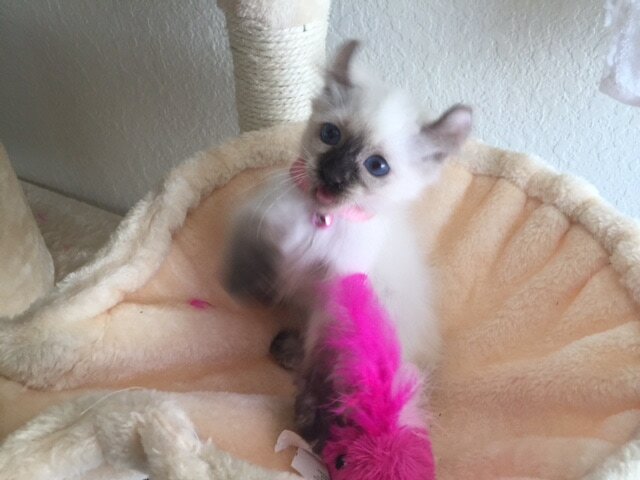 She absolutely loves feather toys to the point where I have to hide them from her because she'll destroy them in less than a day. My favorite part of the day is coming home from work and sitting down and here she comes running to come cuddle. She really has grown into a beautiful and loving cat, and I can't wait to get another one! I cannot thank you enough for allowing me to have Chantilly! Looking at the website, I was drawn to her the most. 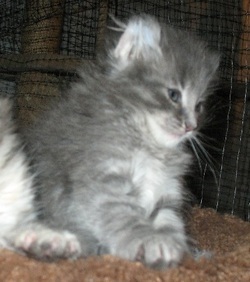 But once Linda and I spoke on the phone, I am adamant about getting her. 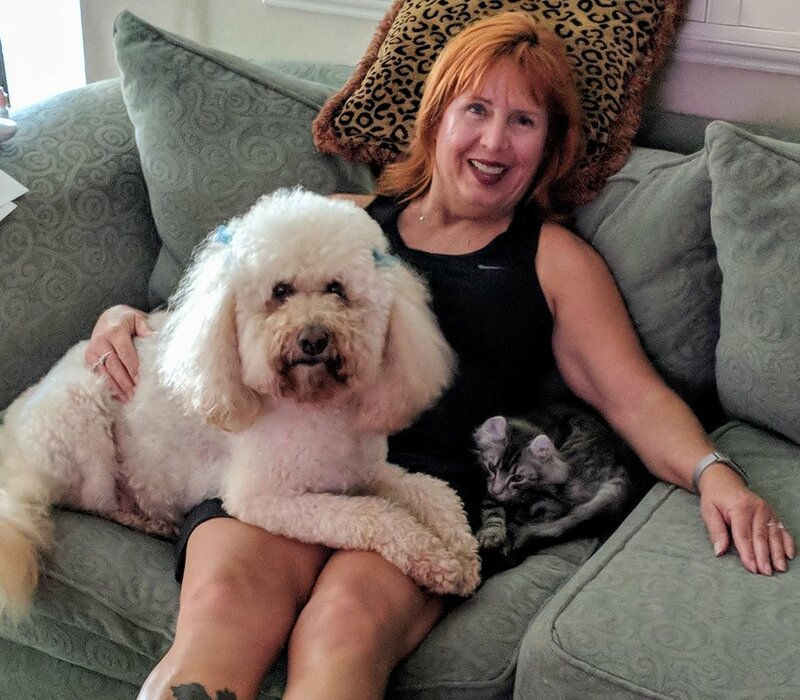 The way that Linda is able to speak about each of their personalities shows how much care and love that your family provides for the kitties. I am so looking forward to the arrival of a new family member and the beginning of a new chapter of my life. But this will not be the last of Chantilly because I will definitely keep you updated about her. 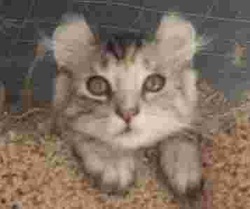 ​I left Gloria's questions in the testimonial because other people may experience similar issues with kittens. The kittens are used to playing and rough-housing with each other and they have tougher skin than we do. Just like small children, kittens need to be taught good manners. Our adult cats still forget themselves sometimes when they are playing or loving on us and they get rough. Usually, a stern "NO!" will teach them what is acceptable and what isn't. Some are more sensitive than other... like Storm. If we tell him NO in a rough voice, he sulks. We have to go find him and immediately pick him up and love on him. His feelings get so hurt. You don't need more than an immediate NO or a light tap on the head to let them know they are doing something you don't like. They want to please you... they just don't know all the rules yet. After a little more than half a week, Chantilly is finally back to her normal self. From first circling around me during meal time to climbing onto my lap demanding to be petted. She has been addicted to her catnip mouse toy. She can easily play with it all night long. I love how during the middle of a play session, she comes over to me from across the room to get a few pettings before returning to her toy. I'm not sure how you've trained her, but she has the best manner ever! 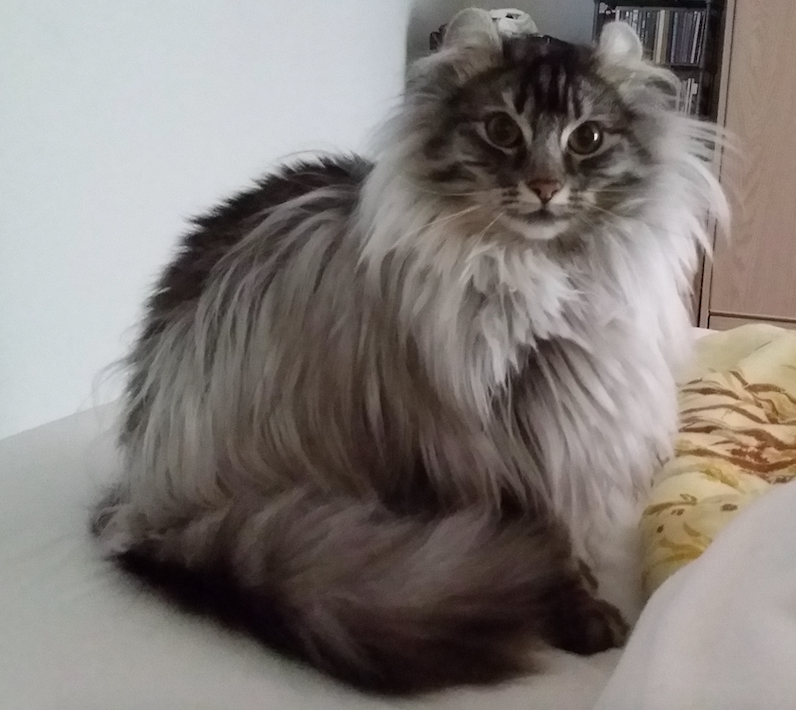 She never disturbs my sleep and waits for me to get out of bed before having a conversation. Everyday I have been returning home earlier than my old schedule just to see her sooner! Since she is feeling much more comfortable with me, she has started to play a bit rough. She often claws onto my sock to drag herself across. Or clawing and biting my knees and feet. Does that mean I should be more gentle with her? Would you have any suggestion about how to calm her down when she gets hyper? Thanks for sending me this fur ball of excitement! They can get so overwhelmed with their playing or loving on us that they can hurt. They don't realize how sharp their little teeth and nails are, and how sensitive our skin is. When you watch them with their mom, even their moms will discipline them from time to time. Just be sure to watch their reaction after you discipline them... like Storm, if you have a particularly sensitive baby, you need to immediately go back and reinforce your love for him/her. This is VERY IMPORTANT. You need to make sure you are correcting their ACTIONS but you still love THEM. I really have to thank you for giving me the privilege to experience a life with two wonderful Boys. Curls are like no other cat or even dog I have ever known. They are the reason I even fell in love with cats. They really are a breed that bridges that gap of the perfect companion and show stopper. And they have these personalities I'd usually attribute to dogs, a sort of human-like quality of mans best friend, but in feline form. I have so much love for my two boys and they just make me appreciate their breed so much when I see how much everyone falls in love, how they touch people without meaning to. 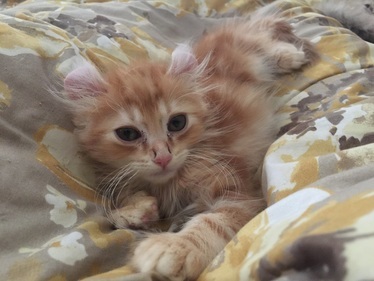 It just fills my heart with warmth to have Seamus with me now and it would be so amazing to just show him off because he is just going to be a gorgeous boy as he grows, and have such a great personality! I'm so excited and just can't thank you both enough! ​Ms. Kitty is doing great. She plays with our dog all day long. She is amazing with my girls and is very loving. Every night, she ends up snuggling with one of the family members and is very attached. Thank you again. Maureen was renamed Ms. Kitty by her new owner. Many of our babies get along great with other pets in the home.... even the family dog. Patience is one of Holly's babies. Her dad is Sir Kingsley, our Supreme Grand Champion. 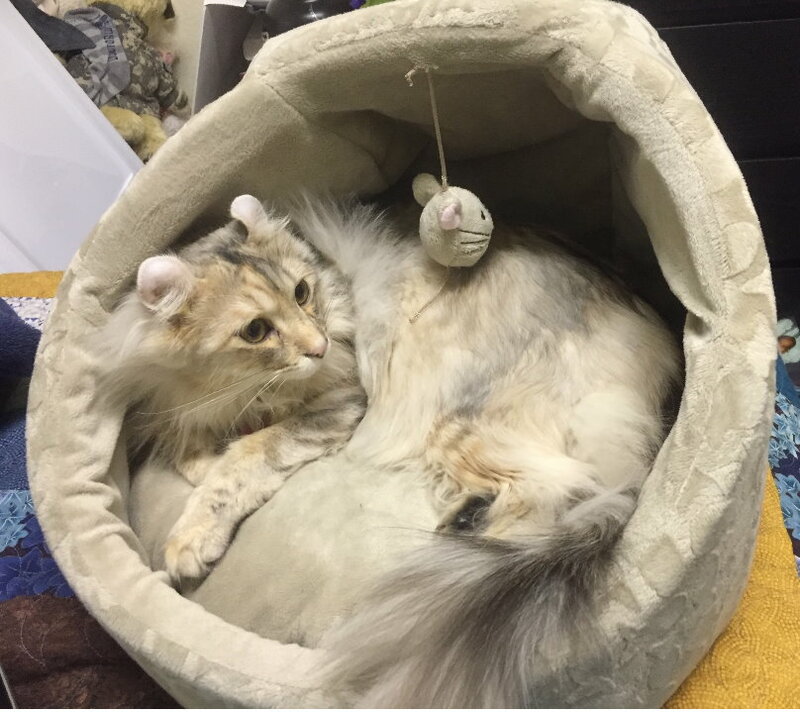 Because we allow our babies to interact with the adult cats before they go to their new homes, they readily accept cats in their new homes. 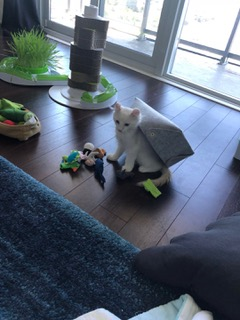 Kittens are very adaptable anyway, but because we introduce them to the adults here at our home, any new cats in their new homes are just "new friends". ​Patience is very sassy and loves getting into trouble whenever she can. She loves to run throughout the house at night and growl when she is playing with the other cats, Patience has so much energy at night. She likes to look outside into the backyard, she sleeps on the cat tree next to the window and her favorite place to be on it is at the top and when she sees another cat in her spot she will paw at them and try to get them off of her spot. She is demanding when it comes to her food, she likes to rub up against us and coo when she is hungry sometimes she will even jump onto the dining room chairs and just sit at the table; that is when she really wants her food. She loves playing with her brother she tries to clean his ears and face, there is times where they will lay next to each other and start cleaning the others face. Arwen has been a great addition to our family. When we picked her up from the airport she was a little frightened. Which is something we had expected. After getting her home we gave her some time to explore. We immediately fell in love with her. Unfortunately shortly after bringing her home (Rhode Island) we had to pack up our home as we were getting ready to move across the Pacific Ocean. Let me just say that, traveling with Arwen was easy. We had her as carry on, on the 18 hour flight she was a gem. The passengers had no idea that we were traveling with a kitten. She was absolutely amazing on the trip. She has settled into our new home here on Okinawa Japan. 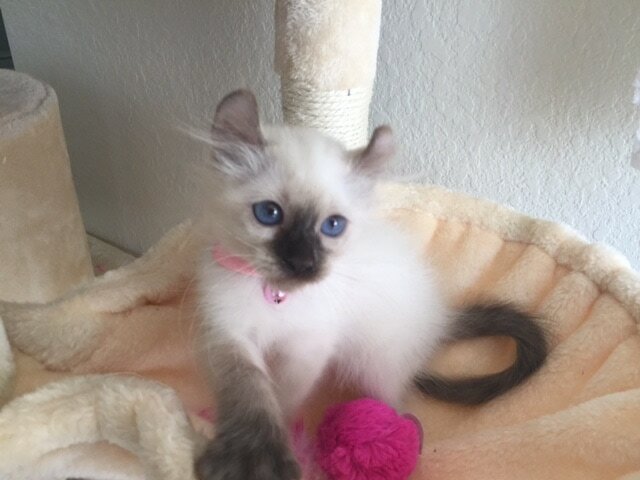 This is the first time my family and I have owned a cat. My husband has had cats growing up and he is always surprised at how sweet and patient Arwen is. 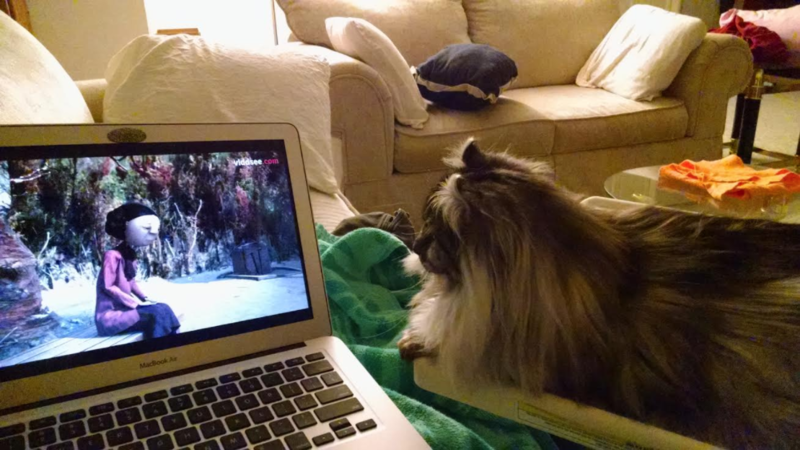 He has said that he has never owned a cat with Arwen's personality. We are very happy that we have Arwen. She is purrfect in every way possible. Hi Mike and Linda... Well, the verdict is in ...they're keepers! They wrestle. They ambush, they chase. They are having a great time together. Doug and I cannot thank you enough for these two boys. They constantly make us laugh. And they are thriving. They eat well and are taken outside everyday for their walk in the neighborhood. Here are some pictures. I'll try to get some outside too. By the way Gary's new tree perch is a big hit also. Yoshi & Kendo... Red Mac Tabby and a Seal Lynx Point goys. Thor is bigger than Theo but he is catching up with him, he's really long and slender. There are some days they get along and some days when Thor doesn't want to play, like any big brother. They have us in stitches with the things that they do all the time. 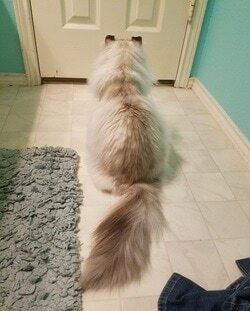 Thor will set at the door and if I'm not home by 5:15 he starts meowing and just watching the door. I think I got a little dog in him because he runs to the door when he hears someone outside. And Theo is just funny, he don't like us picking him up unless it's his idea. But he will come up to you and just flop down on you and go to sleep. Great to hear from you. I will try and take a couple of new photos of Remi and send them. He has really turned into a gorgeous cat. I thought about showing him but I don't really have the time. I think he is one of a kind.His looks have totally changed from the baby pictures. Take care and I will send you the info soon. Burt ReyCurl and Budster are best friends. Budster gets groomed three times a day. In fact, in the morning we all get groomed around 4 a.m. Burt loves to play fetch and sounds like a small elephant and I respond likewise, we communicate. It is a scream to hear me call out "urrumph" and hear Burt ReyCurl answer from some place "urrumph". If he feels that he has not had enough attention, he will beg to be held like a baby and nestle his head in my arm, of course this is while I am at the computer trying to type... he is such a joy. 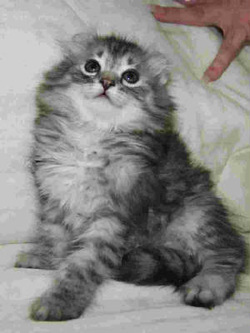 Burt is a Silver Mac Tabby and this was what he looked like when he shipped. 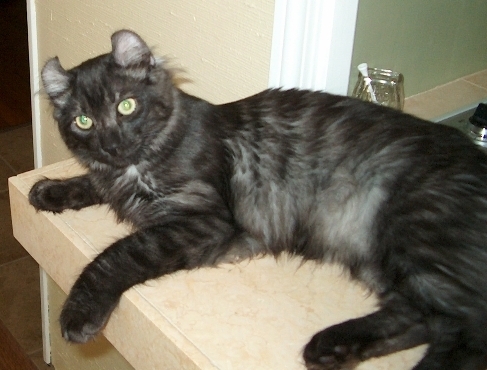 This is "Budster's" playmate "Burt ReyCurl". 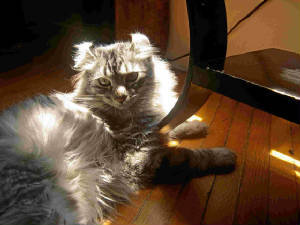 ​Heathcliff iss a Silver Mac Tabby and now resides in Holloywood. I thought you might like to see some pictures of my little guy after he has grown up. 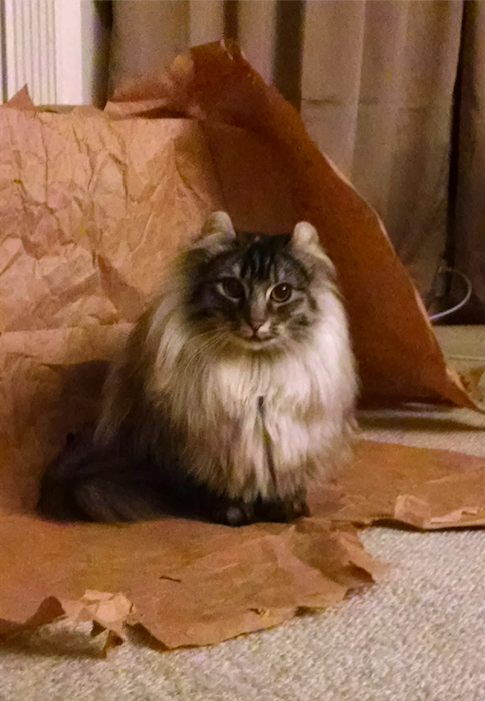 He has the most amazing personality and is the real ringleader of the household, now. He gets more beautiful every day. You certainly were right about these being extraordinary cats. Heathcliff gets to see some real Hollywood celebrities in his new home. We are waiting for a newer picture from Gwens owner. Gwen is a wonderful Cat. Gwen is so happy and so sweet! Everyone that comes in contact with her can't help but fall in love with her. Many people want to take her home with them. LOL! Gwen always has to be touching me in some manner. If I am on the computer she has to be on my lap. If I am watching TV in the living room she has to be draped over my lap with her paws touching me or hanging over my legs. She often sleeps with me in the bed, and then she does a bed check in the middle of the night she will come up to me and pet my cheek and smell my mouth as if she was checking to see if I was still alive and breathing. Hi...hope you guys are doing well. 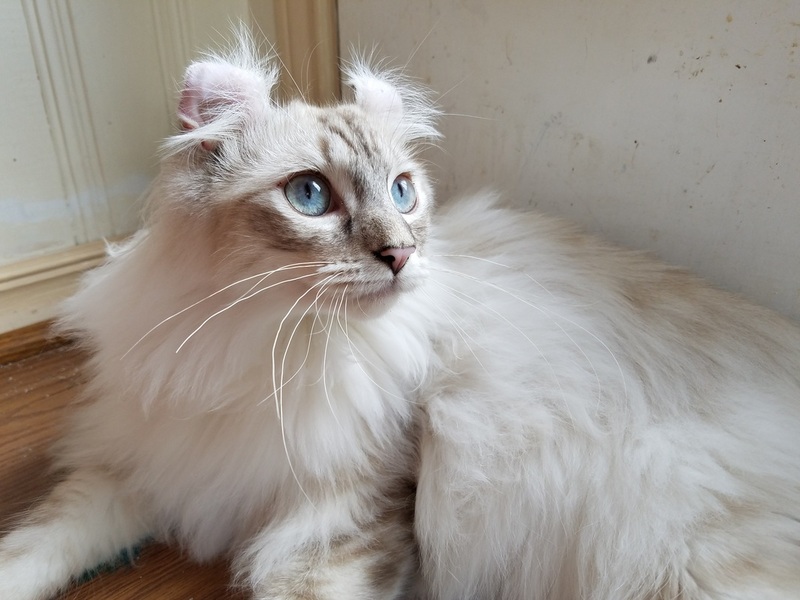 I was on your website... again... looking at your gorgeous kittys. Just wanted to say hi. A couple of Sabrina pics for you. Update on her status. She is still the boss and we... are not. So really no change there. We love her dearly... can't imagine life without her. Arleen says that when she hears my truck pull into the driveway... she runs back and forth from the door to the window to the door meowing all the way. There's really nothing like that... she's the best cat ever. We are being held hostage by a kitten ........... please send help!! apparent that you care a great deal for your animals. You can rest assured we will do the same. When Sabrina gets settled, we will take some pictures and send you the info about our other cat. But if you need someone to run your home she can do it! Vicki now has three of our Curls. Rusty, Dessy, and Wilson. Vicki has joined us in showing Wilson at the CFA South West Regional shows in the Grand Premiere Class. Dessy, the Black boy in the bowl, seems to like to spend most of his time in the kitchen... I wonder why??? Vicki and her family live in the Long Beach/Lakewood area of California and her husband is working in Saudia Arabia. While he is away the cats give her great comfort and companionship as do her two sons. Just as a point of interest the original American Curl, Shulamith, was discovered in her town. Curl Essence Wilson acheives Grand Premiere. The Kittens on our Christmas card. Just an update - the cats are doing Great. Cowboy loves to sit on me all the time... he's a love. We have a gas old fashioned cooking stove heater in the living room and the cats love to sit in front of it. I don't know how they can stand it, it's so hot. When it's not on and they want it on they meow for us to turn it on. They are the sweetest babies. When we have company come over they just go right up to them and love on people they have never seen before. One day we had visitors over and one lady who has a serious illness was in a wheelchair and Kinder just jumped right up in her lap and loved on her and stayed in her lap almost the entire time she was at the house... this lady couldn't speak well due to her handicap, but she was in awe of Kinder and just kept giggling at him. 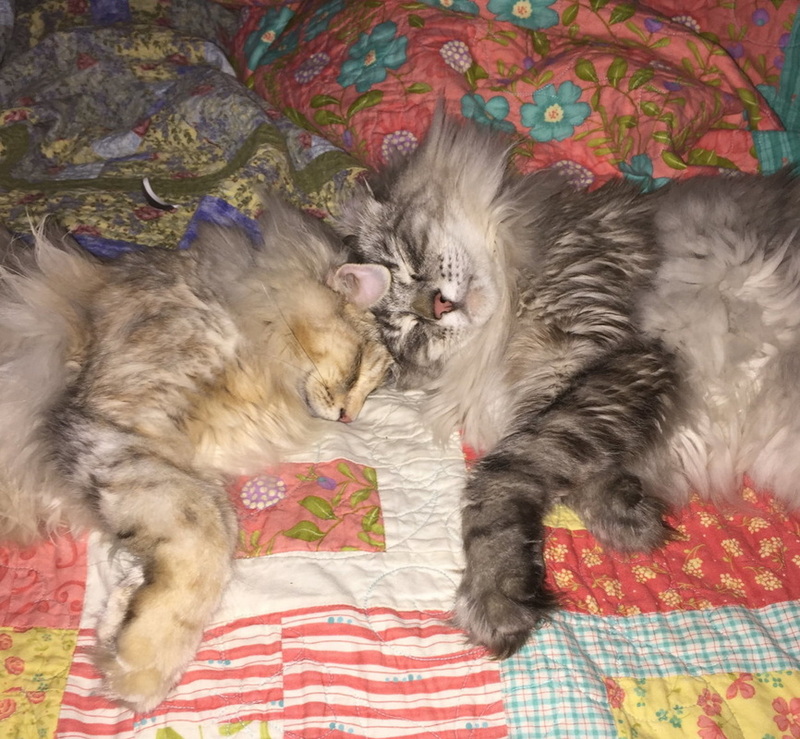 Thank you so much for letting us have these two cats - they are just the best cats in the world! Kali is a joy, for sure. She's long and plump and full of energy! She loves being around us and climbing the Christmas decorations is a favorite pasttime. Thank you so much for letting us take her home - she is really thriving, and I love her so much. My older Grandaughter (4 1/2) is also very taken with her. She comes scooting down the stairs in the morning just to sit with Kali awhile before going to preschool. It has been a powerful motivator for her to eat her breakfast and brush her teeth. Everyone is really loving her (Ryan is also inaftuated with her!) She's a regular Rocket when she gets silly. Kissyfur 2 is just exactly how you said he would be - just like Kissyfur. He loves to ride in the car. If I sleep too late he will jump up on my bed and meow at me so I will get up. He is so sweet and he never stops purring. He is just adorable and my daughter is totally in love with him. Thank you so much for making him ours.